Stockbrokers can trace their history in New York back to 1788 when the purchase and sale of an $80 million bond issue was authorized by the First Congress of the United States. Four years later in March the leading brokers established the Stock Exchange which met in the open air under a buttonwood tree which, reportedly, stood between Nos. 68 and 70 Wall Street. By 1869 when the New York Stock and Exchange Board was born the stock trading business was highly organized and regulated by internal rules. Neither the New York Stock Exchange nor the later Consolidated Stock Exchange would trade unlisted securities. This led to a rather disorganized group of brokers who met on the curb outside the New Street entrance of the New York Stock Exchange. This noisy tangle of men became known as “the curbstone brokers” and their market The New York Curb Market. The disjointed, unregulated market was rife with unscrupulous swindlers and questionable trades. Worthless stocks were sold and unwary buyers bilked. In 1873 E. E. Mendels attempted to rein in the process. Called the “Father of the Curb,” he drew up an informal agreement which eventualy became the Curb Market Association. The New York Curb Market moved its operation to Broad Street and tourists would flock here to witness what appeared to be an undisciplined mob of brokers shouting and waving signals to clerks hanging from the windows of surrounding buildings. Through sunshine and rain, sleet and snow, the brokers dealt in the open air for decades. A vintage postcard captured the mob of brokers on Broad Street. Some members of the Curb Market recognized that a move into permanent, indoor headquarters would result in respectability. But they were in the minority. The greater number of curb brokers were only marginally successful and respectability was not their priority. Besides that, the curb was a cherished tradition. Moving indoors was not an option for these members. But at the same time high-powered New York Stock Exchange members like J. P. Morgan were eying the Mills and Broad Exchange buildings where Curb Market clerks kept tabs on the action below. They wanted the Curb Market gone. Pressure was put on the leaders to move and the threat of the area simply being taking over, thus dooming the Curb, was evident. Despite being in a minority the brokers who wanted to move indoors were the most powerful. Edward McCormick, Alfred Sturges and Franklin Leonard were the leaders of the movement and they forged ahead with their plans. The great majority of the Curb brokers had no choice but to follow along. If they remained on the street they would simply see their business wane and eventually die. 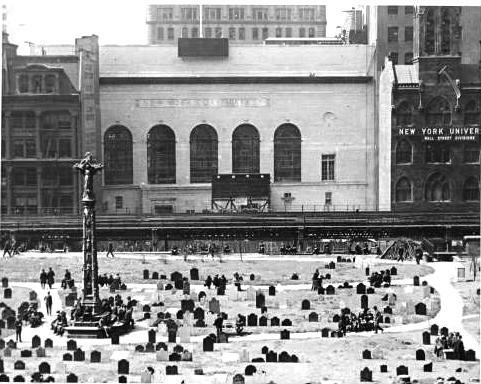 Ground was broken in November 1920 on Trinity Place, somewhat surprisingly distant from Wall Street. The expansive $1 million plot faced the graveyard of Trinity Church and ran through the block to Greenwich Street. Architects Starrett & Van Vleck were given the commission to design the new structure. If the architects were given latitude in the exterior design, they were given specific instructions regarding the interior. The New York Curb Market had a tradition of street trading. Its brokers had unwritten territorial rights to lampposts and other easily-recognized street structures where they could be easily picked out by their clerks. Except for the coffered roof above the brokers’ heads, Starrett & Van Vleck were to recreate the outside Curb Market. The $1.2 million building rose rapidly and on Saturday, June 25, 1921 the Curbstone brokers held their last outdoor sesssion. The following Monday an impressive ceremony opened the new New York Curbstone Market. Around 8:00 in the morning the Curbstone brokers assembled on Broad Street as they always had, along with their clerks. Each broker was assigned his position in the new building. Despite the $1,500 membership fee in the indoor market and the $500 initiation fee, moods were high. Some of the brokers risked their last dollar to stay in business, but there was no other option. 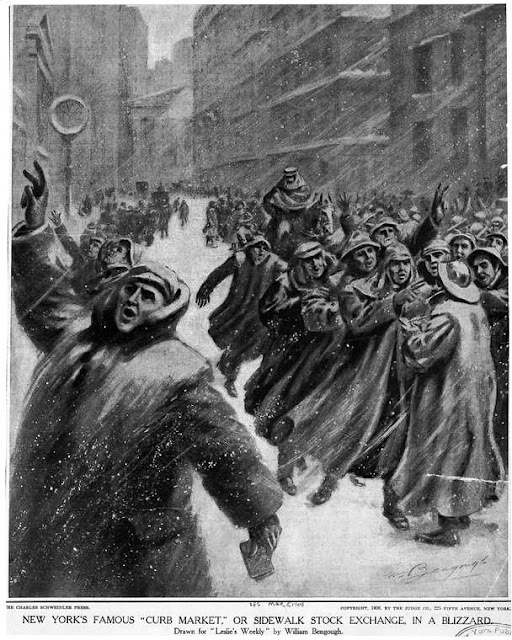 Thirty minutes before the market was to open, at 9:00 a.m., Edward McCormick began the procession to to Trinity Place. The large group arrived at the new building and McCormick gave a succinct speech that began, “The die is cast. The old order is gone forever.” The brokers then sang “The Star-Spangled Banner,” the doors were opened and the men pushed in. Here they found a virtual street scene. Tall posts resembled the street lamps of Broad Street. Stepped “terraces” against the walls provided clerks elevated positions from which to catch hand signals from their brokers as they had from windows. The roof above would keep out the rain and snow, but the walls would keep out—at least in McCormick’s and his partners’ hopes—cheats and crooks. Starrett & Van Vleck’s structure, constructed by the Thompson-Starrett Company, was simple and reserved. Constructed of light gray brick and limestone, the flat facade was broken by a series of expansive arched windows that flooded light onto the 65-foot high trading floor. The Evening World described the architecture as “a combination of Greek and Moorish art.” The Greenwich Street façade was a carbon-copy of the Trinity Place elevation. Inside, the trading floor was lined with 16-foot high wainscot of Bottochino marble and a large visitors’ gallery at the north end afforded an uninterrupted view over the floor. Below ground were a large restaurant and cafeteria and the coatrooms for the members and employees. The third floor housed executive offices for the Curb Market Association. In 1931, now known as the New York Curb Exchange, the group remodeled the main façade at No. 86 Trinity Place, giving it an up-to-date modernistic face. Perhaps to save money, however, the Greenwich Street façade was left as-is. Change came again to the Curb when in 1953 the name was changed to the American Stock Exchange. Massive lettering was affixed to the Trinity Place front announcing the new name. But on Greenwich Street “NEW YORK CURB MARKET” still remained carved into the stone. In 2008 the exchange was absorbed by NYSE Amex Equities and it abandoned its old headquarters for Wall Street. The massive building sits unused and largely ignored, the last remnant of an uncanny and quirky time in New York stock trading.